A new presidential race is always an exciting time for Saturday Night Live. Not only does the sketch comedy show have a lot of important news to cover, but there is so much comedic potential with each candidate. During the upcoming 2016 election, there will certainly be new easily parodied figures that most of us are barely aware of at this point — but there will also be some old favorites returning: This includes Hillary Clinton, who confirmed she'll be campaigning for presidency in 2016. Which leads me to wonder: Will Amy Poehler return to SNL to play Hillary Clinton in new sketches? 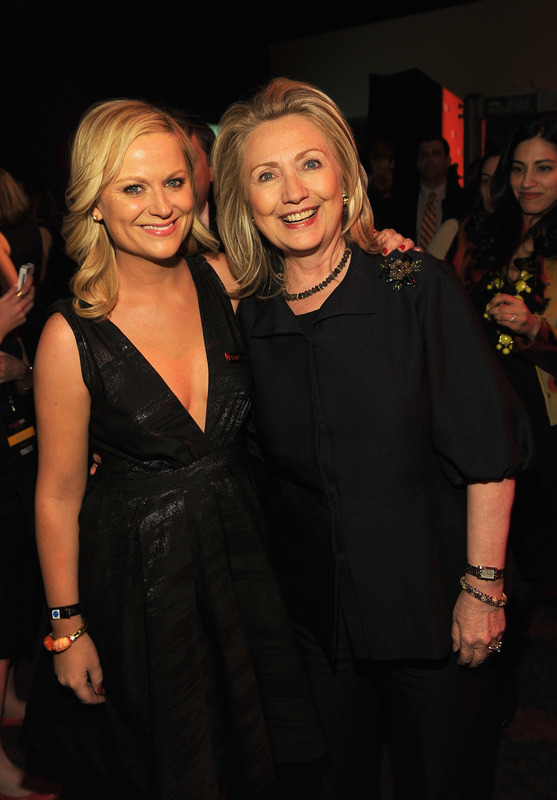 Amy Poehler might now be a redhead, but she still bears a strong resemblance to Clinton. As you probably remember (but should definitely revisit anyway) Poehler played Clinton on SNL during the 2008 presidential election, just before Poehler officially departed the show. Seeing Tina Fey's Sarah Palin converse with Poehler's Clinton was a cathartic and hilarious highlight of the election. But, will Poehler return to play Clinton again? It seems possible, if you consider her SNL history. Her 2008 stint as Clinton took place when she was technically on hiatus, as she was having a baby. Fey herself also returned to play Palin after she had left SNL (in Bossypants, Fey hilariously mentioned that everyone clamoring for her to play Palin made her realize no one had noticed that she'd left SNL). Poehler has since returned to the sketch show in a couple of cameos, so it's clear there's no bad blood there — why not another return now? Poehler also has her schedule relatively freed up. She no longer has Parks and Recreation, and is now filming the Wet Hot American Summer Netflix reboot. Hopefully, without the burden of running and starring in a show, she'll have a bit more free time for fun cameos. Kate McKinnon has since played Clinton, and though she does a great job, it isn't quite as historic as Poehler's performance. In the upcoming election, I can see McKinnon taking on the brunt of the Hillary impersonations with maybe one or two appearances by Poehler. Maybe they will even appear together! Whatever happens, I can't wait.